Yodel has unveiled a semi-automated sortation system, named Merlin, for “uglies” – large, out of gauge and delicate parcels. The £1 million system has been installed at the Wednesbury sort centre replacing two manual sorting carousels. It can handle items up to 1.8m long and up to 0.9m wide. It is capable of processing up to 2,500 metre-long items per hour and will greatly enhance the speed and efficiency of the out of gauge parcel sorting process. 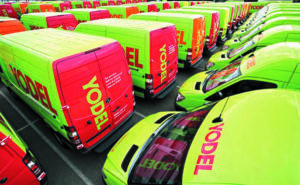 Yodel reckons uglies account for about five per cent of the market by value.